I’m no art critic, by any stretch, but i do appreciate viewing an occasional handful of paintings as part of a lively cultural scene. 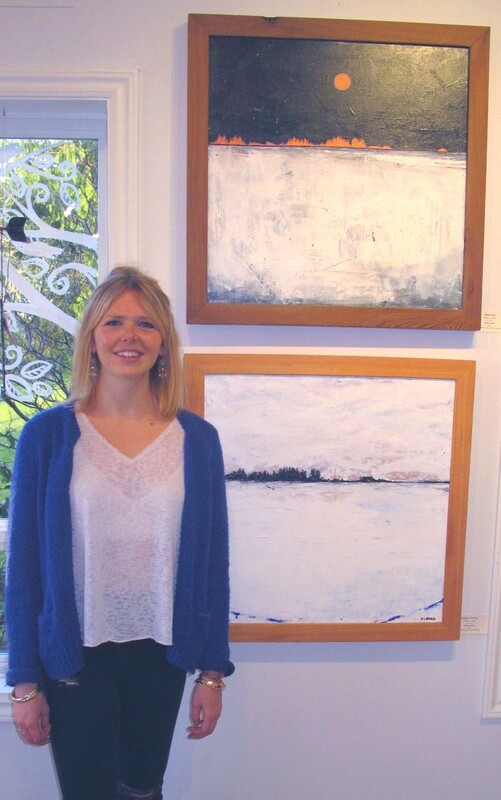 A new art show opened Saturday at Main Street Gallery & Espresso Bar (in Tofino Sea Kayaking, 320 Main St.), at which emerging Tofino artist Victoria Leader displays some recent work. This is not that. Known for her pencil portraits, drawn live at the Tofino Saturday Market, Leader here branches into acrylics with her own take on the West Coast beach and wildlife. The two below, shown with the artist, anchor the show, to my eyes. (Sorry for the poor photo.) Startlingly stark, they are yet immediately recognizable as West Coast beach-and-sky scenes for anyone who has ever experienced such, but are likely a mysterious, possibly Arctic abstract for those who haven’t. The paintings, in a way, illustrate our little secret: that, in the large scale, ours is an abstract landscape: blocks of monochrome grey-greens fading into distant mist, flat beach expanse rippled with shadows, a dozen different skies on any given day, the ocean a mosaic of any number of different greens and blues. West Coast painted landscapes tend to be representational — the sunset pink-and-orange, the cunningly rendered crashing wave, the fine brush-strokes of arboreal or animal photorealism, have all been turned into high art by local painters. Leader’s textured slabs of colour, worked with a knife over backgrounds of unusual and decidedly non-West-Coasty burnt orange, flip that tradition upside down — an arresting take on what is otherwise a pretty uniform art scene. 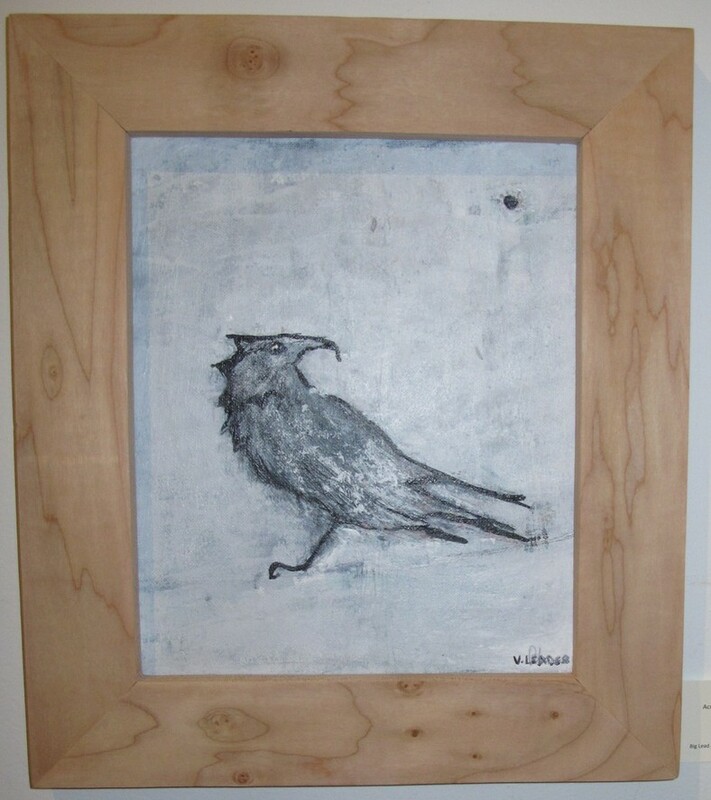 The paintings are boldly offered, acrylic on board, no glass, and with a variety of raw and finished wood frames by Tofino Woodworks. They also feature reasonable prices (another West Coast rarity), which may entice a few of them onto the walls of locals, and some of our more adventurous visitors. Leader is a relatively new painter, i gather, still experimenting her way into the medium. Some pieces feel less polished, to be sure, but that may make them more approachable, in a folk-art kind of way. What she does bring to the scene is fresh eyes. I for one appreciate it. The show continues until May 31, 2017. 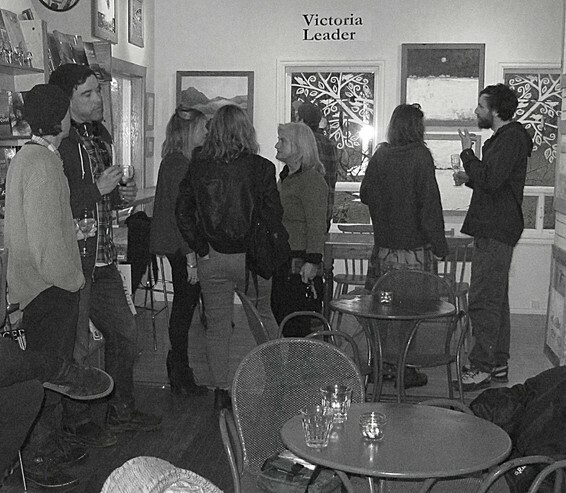 Artist site (victorialeader.com) and blog (victorialeader.blogspot.ca). Thanks to the Main Street Gallery & Espresso Bar (320 Main St.), for putting a regular series of art shows on Tofino’s cultural calendar. A dedicated show is a significant step for any emerging artist, and MSG&EB provides pretty much the only spot in town for such a venture. Excellent coffee and view, too! This entry was posted in art, installation, review by greg blee. Bookmark the permalink.